What days can you come in? We're glad we could help you find an excellent cosmetic dentist. Before you contact Dr. Ross Headley, we have a small favor to ask. Some of our dentists aren't aware that they are getting referrals from mynewsmile.com, so could you let them know? When you visit the office, tell the dentist directly that you were referred by the MyNewSmile website. That will help raise awareness of what we are doing. Dr. Headley has extensive training in cosmetic dentistry through the American Academy of Cosmetic Dentistry. He is the only dentist in Kansas accredited with the American Academy of Cosmetic Dentistry. 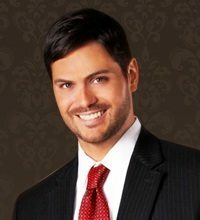 Dr. Headley sees a number of beauty pageant contestants from Missouri, Kansas, and surrounding states, and you will often find one of his patients in the top ten contestants in the Miss USA pageant every year. A couple of years ago, the winner was one of his patients. He is also certified in Invisalign® invisible braces. We have one of his stunning smile makeovers posted on our smile makeover page. We also have work of his posted on our dental bridge page and our porcelain crowns for front teeth page.